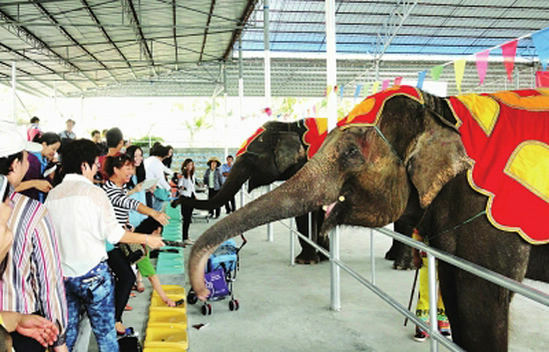 The Thailand Elephant Performance Center in Sanya was opened to public on the opposite of the marine zoological park in Tianyahaijiao Scenic Area on Jan.1. With the total land area of 238 mu, the center can hold 1,000 audiences. At present, there are five performance programs to be provided every day. Besides the elephant performance, the audience can also enjoy many other performances in the performance center, such as the breathtaking performances of the African male lions, the Tibetan wolves, bears, goats, macaque monkeys and tigers. According to the relevant responsible person, the center will increase more elephants and more types of tigers and other animals.